Sometimes we just need to take a short cut or two. Over brunch, we can take our time with planning, preparation and cooking. But when it comes to breakfast, true, race-out-of-the-house breakfast, speed and ease is of the essence. Every once in awhile, I like to use a pre-done product to shortcut and streamline a meal. 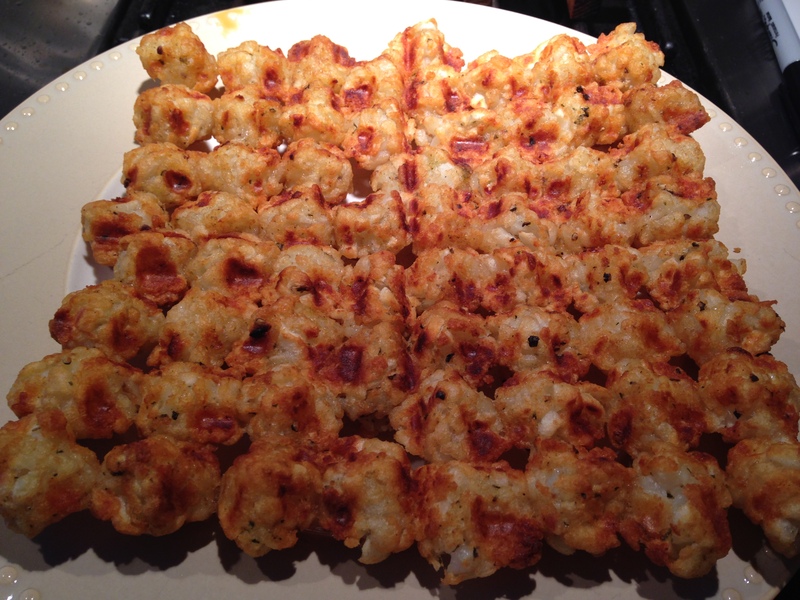 Alexis Potato Puffs are a delicious, gluten free, way to have a creatively fun breakfast option. 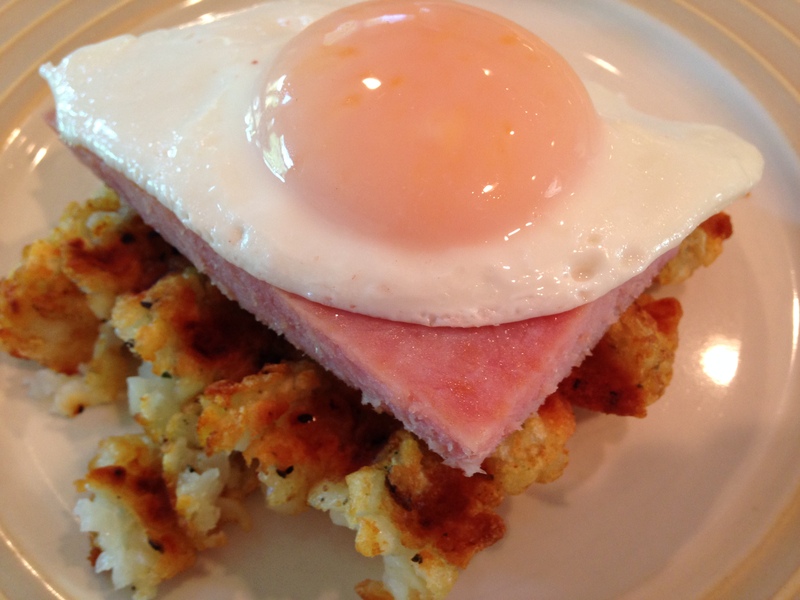 While your tot ‘cakes’ are cooking, you can fry your ham and eggs. I encourage you to leave the yolk runny, that way you have a built in healthy ‘sauce’. My trick to a perfectly cooked egg: Start the egg in a skillet, then throw a tight fitting lid over the pan, turn the heat down and ‘steam’ the whites on the top. Voila! Isn’t that a beauty? This meal is so versatile, you can dress it up or down. Serve it with a hollandaise, or melted cheese sauce. Salsa would be delicious if your meat was fried chorizo sausage. Add a thick slice of tomato, basil and bacon and you have a riff off of a BLT. Give it a whirl, and be sure to leave your ideas in the comments below! After a week away from my family, and my ‘at the hip’ companion Miss Mia (my loyal canine), it feels good to be home. Strange how the week flew by. To be honest, while at camp I was so busy, and so tired at the end of the day there was little time to be lonely and miss my family. I love my family, I just didn’t have time to miss them! There are so many great things I learned in that week, but here are a few that stand out to me and I think might be worth sharing. 1. We all eat too much. I was surprised and astounded at how little food we need (both men and women) to function and perform well on. Maybe I should restate that: How few CALORIES we need to fuel out bodies. We ate very well there, there was plenty of food to fill you up. However, the food was low calorie, high fiber and high quality. Yes some of the meals were bland, some unattractively presented and some which people didn’t care for. But they were nutritionally sound and filling, if you ate it. The salad bar was plentiful and if you were still hungry, you could fill up on that. Every day there was a board giving us the days approximate calories, give or take if you ate it all or had a lot of beans or egg whites with your salad. We averaged about 1,500/day. We worked out every day for a minimum of 4 hours, HARD workouts. And yet, no one collapsed, or passed out for lack of energy or nutrition. Everyone who was there wanted to drop a pound or two, and everyone did. But that was because we were exercising for the vast majority of the day. What shocked me was the calorie consumption of the trainers. It wasn’t much more than ours. The marathon specialist told us she averaged about 1,300-1,500/day. While I’m sure she carb loads for marathons, it’s not her daily intake. Yes, that was an eye opener for me, as well as re-aquatinting myself with valid portion sizes. I am not going to be one to dictate what people can or cannot eat, but people need to be honest with themselves. Most people are overweight (and/or under muscled) because they consume too many (and low quality) calories and they don’t exercise enough. 2. I am strong and I am tough. I am empowered. In my younger days, (which honestly seems/feels like yesterday) I did Outward Bound. It is something I am very proud of. For those not aware of what it is, it is an outdoor experience encompassing many mental and physical challenges and ones endurance. It involved backpacking with a group of about a dozen in the mountains of Central Oregon for a month, with only one resupply. We did it all: rock climbing, repelling, glacier walking, sleeping on mountain tops, miles of hiking and more. It was hard, it was grueling, but it was empowering. I felt strong, both internally and externally. Then life happened: marriage, work, children, joy, sorrow, death. Somewhere in all of that, I lost that strong, independent, empowered, optimistic, life loving part of myself. In a strange way, this experience brought that all back. While I was not in the woods, the comparative physical difficulty of what we did, along with the mental change was very similar. I had become rather jaded of my fellow man. I had lost faith in humanity and mankind, to a certain extent. But being with that group of women who all were so supportive, encouraging, and were downright good people, let me see the world through a fresh lens. Driving home, feeling the rush of endorphins through my system, I felt true joy again. It’s been years since I’ve felt that way. Driving along, jamming to tunes, enjoying the blue sky, warm sun, the joy just overwhelmed me so much so that I burst into tears. I cannot remember the last time I felt like that; so full of joy that it brings one to tears. That was the mental achievement. I am empowered. Then there was the physical achievement. When I arrived, I felt old and creaky. Creaky is the best descriptive word I have. My back and hips hurt so much that I tended to tip forward, like you see in many of the elderly. My knee has been operated on twice, and it always seemed to hurt. I’ve had frozen shoulder recently, and that always barks at me. That first day we did our first 5K, and the best I could do was power-walk it in 52 minutes. Not as slow as some, but pretty pokey in my own mind. Betty, one of our trainers (the marathoner), was running the opposite way checking on all of us as we went. As she passed me by, she asked me if I had a knee issue and I told her yes. She said “try to walk faster, keep your arms up”. I did. Still, it was 52 minutes. That was followed by AMRAPs. (as many rounds as possible, in a designated time) That was the ‘introduction’ to the week. It was all uphill from there. But, I did it. I did it, and I did it better than I thought I could, or would. On Friday, we repeated the 5K. I jogged it in 38 minutes. I shaved 14 minutes off my time just 4 days earlier, AFTER exercising the equivalent of 4 marathons! Better yet, I came in 3rd behind a 17 year old girl and a 6ft+ man who were already in shape. There is my physical achievement. I may have turned 50, but I am strong. 3. Take each day as it comes. This was no ‘diet’ program. This was a lifestyle they were teaching us. Eat well, eat right, watch your portions, listen to your body, be active. Best advice of all, take each day as it comes. If you binge out on pizza one night, don’t beat yourself up over it. Simply get back on track the next day and keep marching forward. Nothing is ‘off-limits’, but everything is in moderation. There is no guilt, no denial. It is entirely about education, awareness, and real life application. This is no one night stand, this lifestyle is a marriage. This is about learning to live in this body we have and treating it with the care it deserves. I’ve heard people say (almost as an excuse) ‘You only have one life’, and that is true. But to live that life, you only have one body, so take care of it. We all know that truth deep in our souls, but many (myself included) don’t want to hear it. We want to be able to have our cake, and eat it too. This was part of the mental re-boot I desired. It was achieved. Going in, I had no concept of what I was going in to. I have never watched ‘The Biggest Loser’ TV show, and so I knew nothing about it. I had a friend who had gone to one of the resorts, and when I asked him about his experience he spoke very highly of the organization. He said it was hard to describe and put in to words the encouragement and support you get while there. I know what he means now. It is. It’s supportive, encouraging, but accountable. They expect the best you are capable of, and will push you to achieve it. And guess what? You can, and you will. I went there with two goals: lose weight, mental re-boot. I did lose some weight, a bit, but what I now value the most is the mental re-boot I accomplished. In the end, it is far more important to change your perspective and frame of mind than it is to lose a few pounds. I highly recommend this camp to anyone who needs a mental re-boot. Weight loss is a side benefit, but the meat and potatoes of the camp is the feeling of empowerment and motivation to be better than you were. I cook fairly healthy already, but I had lost sight of portions and I didn’t exercise nearly enough. I now have both, and they have given me the tools to use for the rest of my, hopefully, very long life. As women, we have a lot of influence in our households. So while this affects me directly, my family will also benefit also from my new knowledge and action. Yes, I give this program a ‘Thumbs Up’. While standing in front of the dairy case, I spotted Goat Milk. Hmmm, I wondered how that would taste in a Panna Cotta? I grabbed a carton and sped home to whip up a batch. Honey is a natural companion to goat, and the real vanilla bean gives it added punch. It turned out so well, I think this will be a semi-regular dessert to have around the house. While tinkering with the milks, I also leaned the recipe out tremendously. I made a quick jam out of frozen blueberries to go on top. I hope you enjoy this extremely tasty version of Panna Cotta as much as we do. The best part is, you can enjoy and not feel guilty! In a 2qt saucepan, add 1 cup of the milk, the vanilla bean & seeds, and sprinkle the gelatin over the top. Let sit for 5 mins to bloom. Bring this mixture to just under a boil. Bubbles will appear around the edges of the pan, the gelatin will dissolve as well as the sugar and honey. Let steep for 5 mins to extract flavor from the bean. Remove the bean add the rest of the milks, stir to combine. Portion out in to serving dishes. I like to serve mine in wine glasses, but ramekins work well to. This makes 6 generous servings. Cover with plastic wrap to prevent a skin from forming and refrigerate for at least 4 hours. Serve by itself, or garnished with a homemade jam, berries, mint and a little whipped cream.